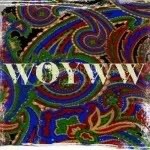 Warning: Loads of pictures here! But only a few as standalone, the rest will be visible in the included gallery. 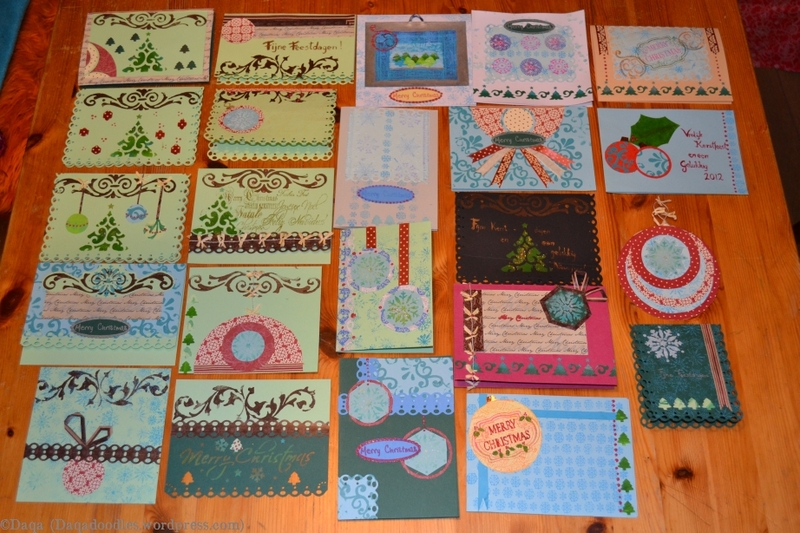 As it is still in my “ready to upload” folder, it seems I never posted about my Wintercards 2014. 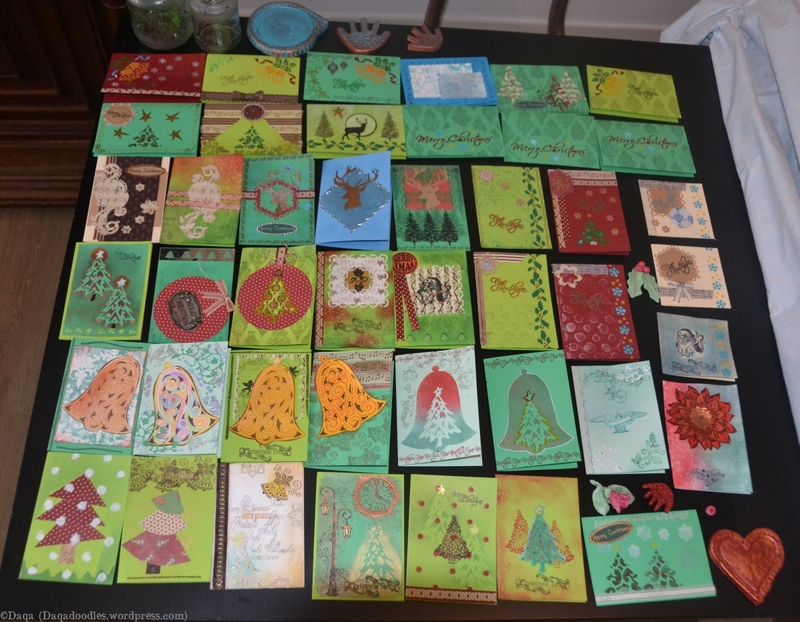 I prefer to refer to them as winter or “good year” cards rather then Christmas cards. As the season is slowly coming again it isn’t very strange to post these seasonal cards here. Can’t really say wintercards now either, with today having felt like september – 16 degrees Celcius! Tropical Decembercards seem very appropriate. 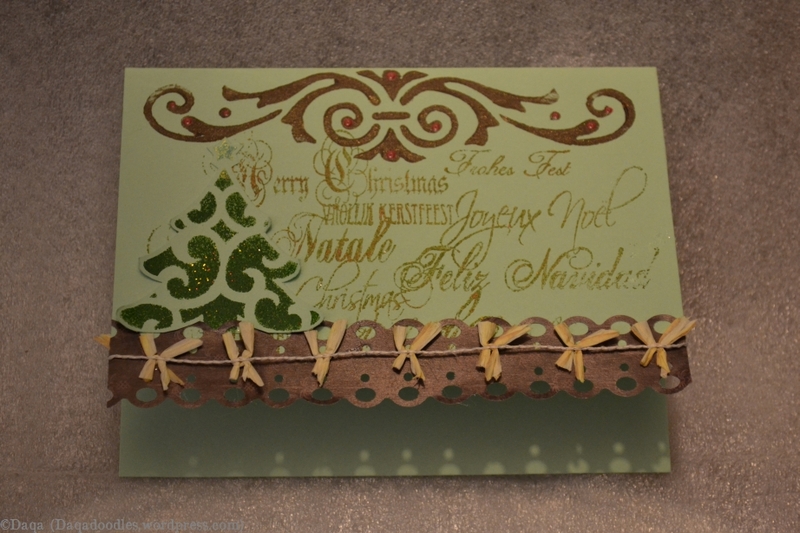 As you can see not many standard colours, this was due to the challenges of Chocolate Baroque and due to my own “challenge” of making winter cards with non-traditional colours. On the 3rd row from the bottom: cards 4,5 and 6,(and above) and the last one (nr. 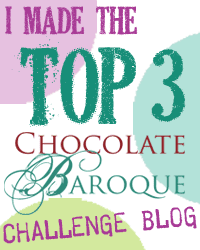 7) are made with Chocolate Baroque stamps for their colour challenge too. 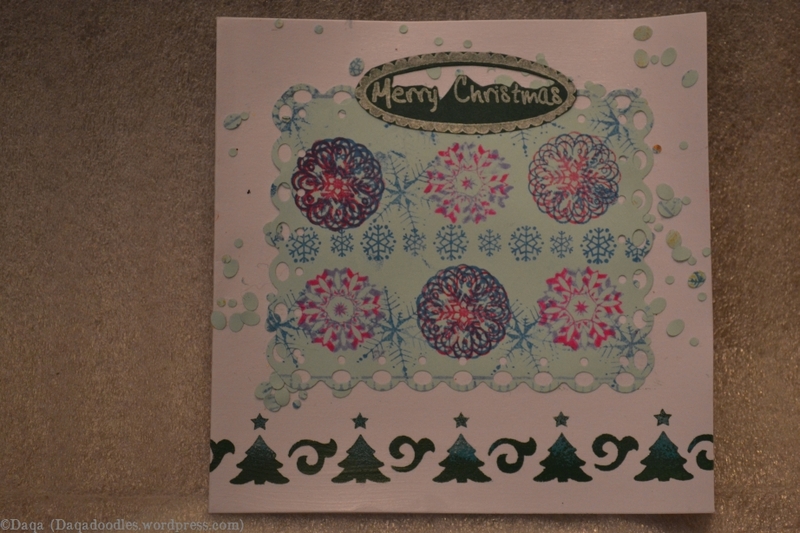 4th row: Card 1 and 2: I used patterened paper! card 3,5,6 CB again. Below a better view on some of them. 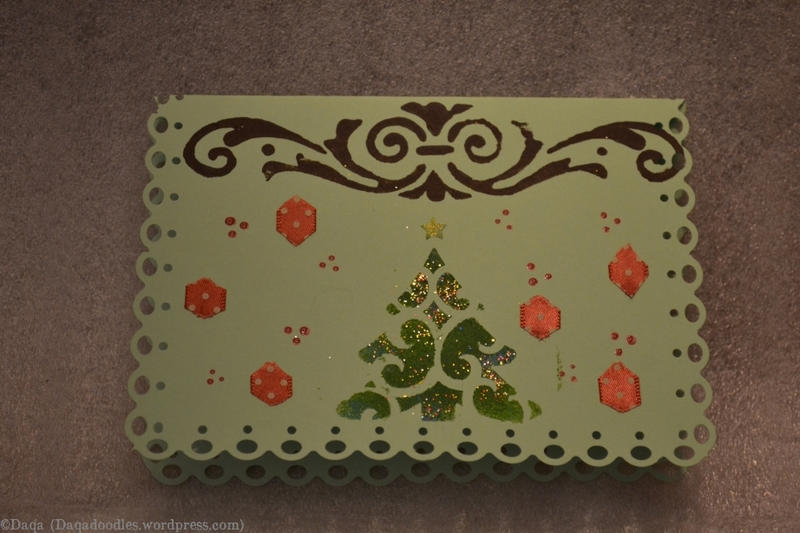 Also used TCW stencils, Joy! 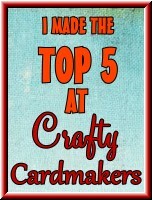 Crafts and Marianne designs dies. 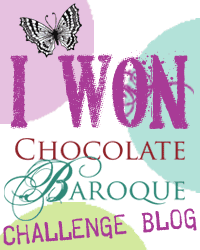 More Chocolate Baroque stamps used. 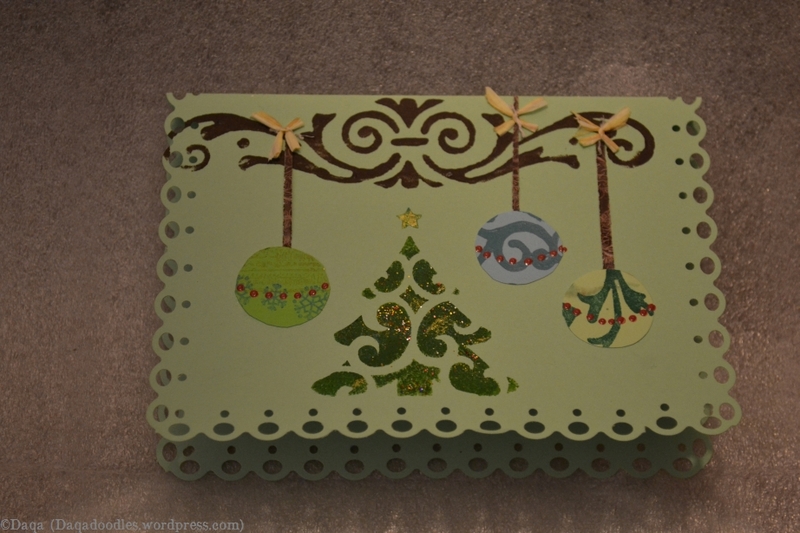 The baubles on the almost bottom corner are from a clearstamp set – might be Viva Decor or a set from Kruidvat. The bright purple tree is Art Journey. 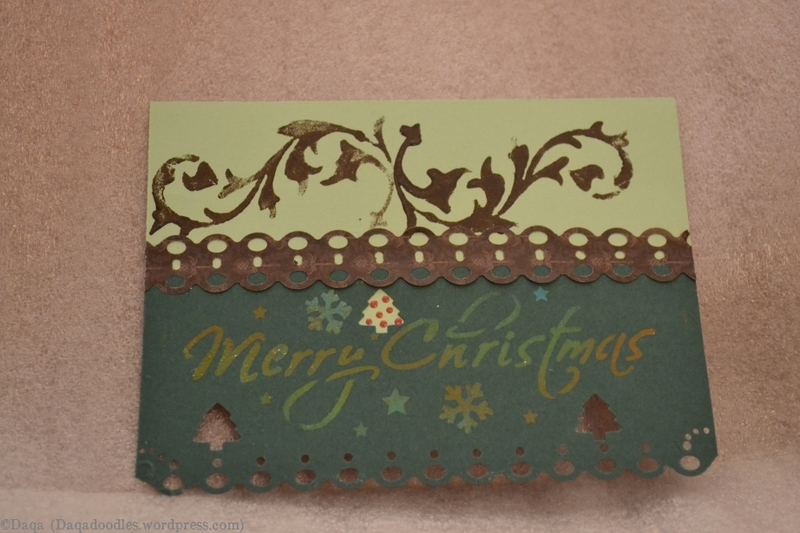 The large wing cards are made with a stencil. 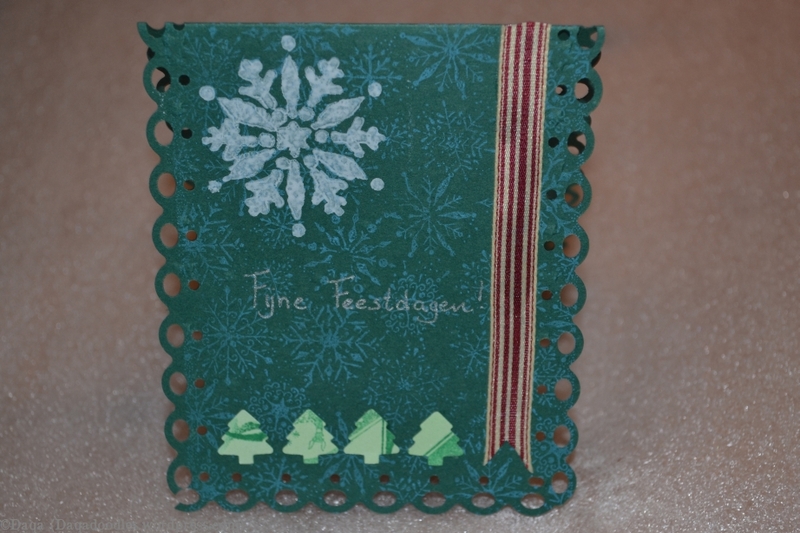 And finally the top rows, the first two cards not having been sent offas winter cards. 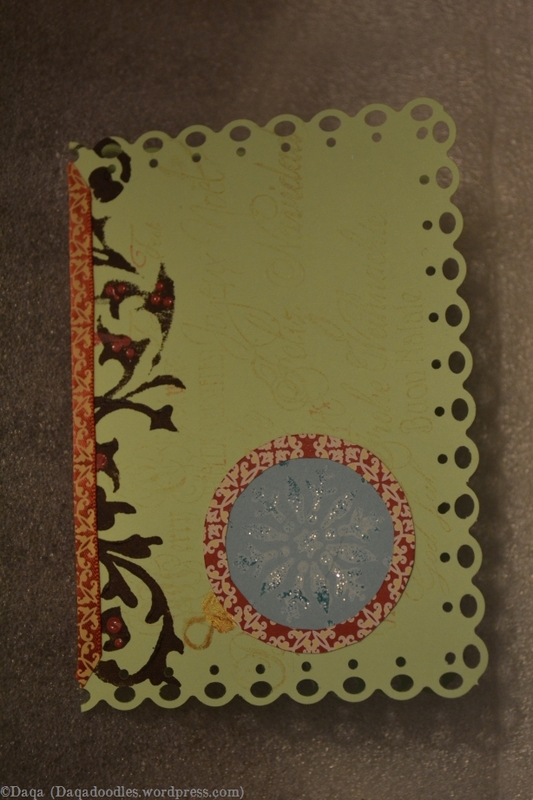 The 1st row last two cards are much more grungy than the others, it was a bit more experimental. The 2nd row first two cards are also a bit more experimental, not sure if I sent those off. 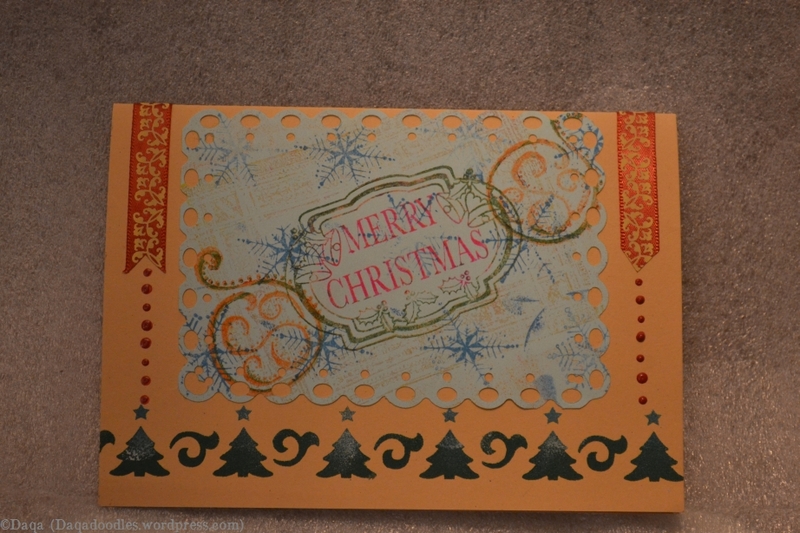 On 2nd row 3rd card I used some chipboard things I’ve had for ages! didn’t know they looked that good on a card. 2nd row last card: looks strange on the picture. 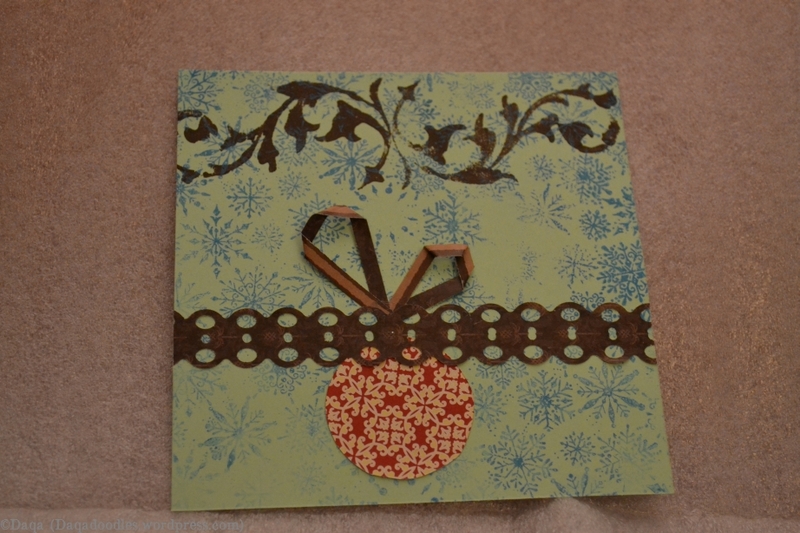 It was patterned paper in which I embossed a bauble and then inked it up probably. 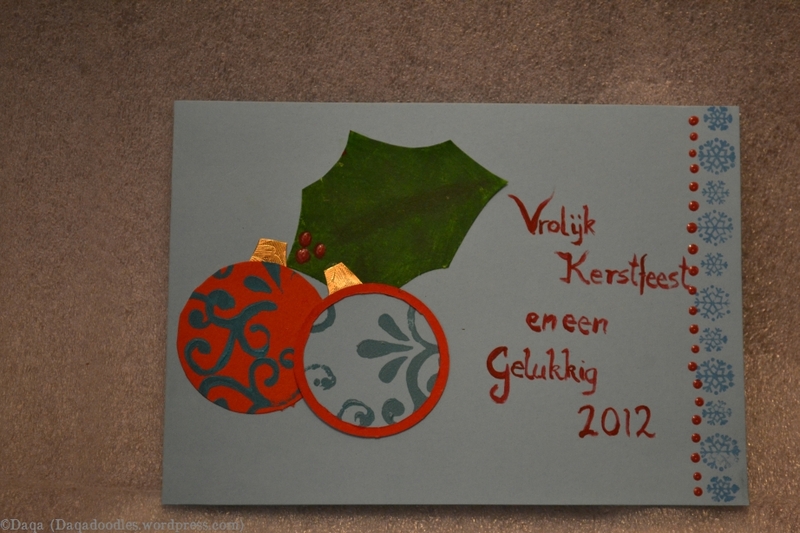 This year I made my own christmas cards ofcourse. 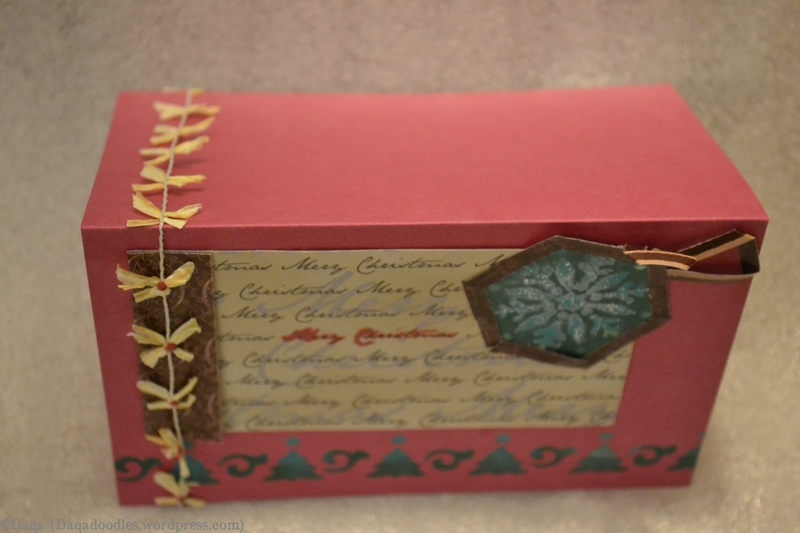 I started quite late (in the week before christmas…). The first batch was mailed the day before Christmas. 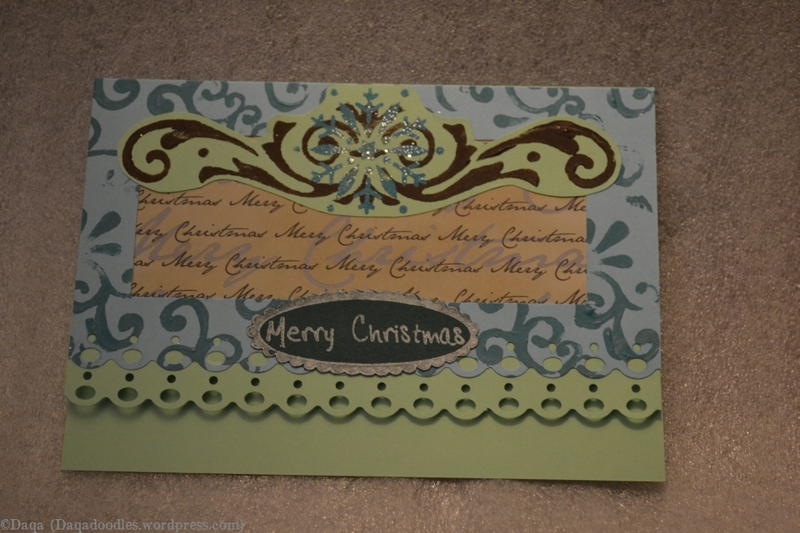 The second batch was even be mailed after jan. 1st, but hey, a card is a card! The second Christmas day and following days I had a bit of a stomachflu, 2nd Christmas day I was in bed all day, next day was a bit better and on Friday I thought I was better. Anyway, I had lots of fun making the cards and wished I had more time to make more. I tried to vary a bit, but sometimes I liked a certain theme or method a lot so I repeated it. I became quite good in making multiple cards now, like one evening (2 hrs or so) I made 8 base cards, and the next evening I finished them, adding variety and detail. Last, when I had a bunch of cards ready, I wrote them. 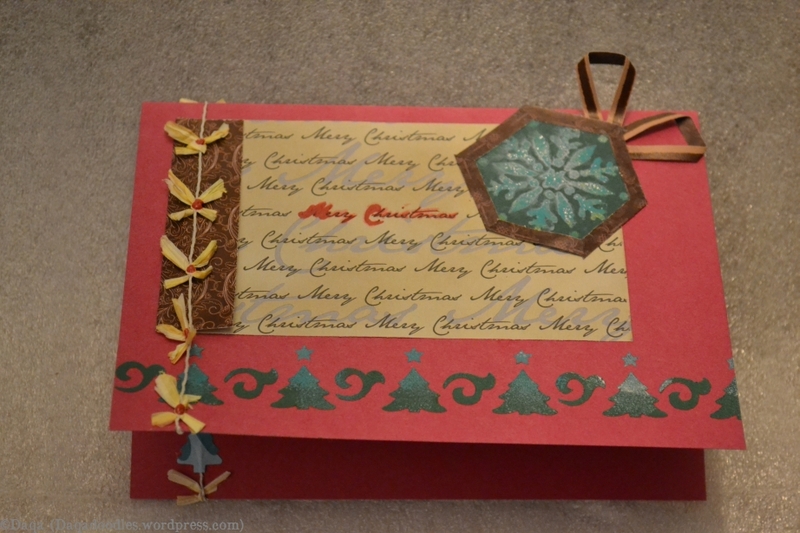 I even made a few envelopes myself as I didn’t have enough and it was fun to do. First and overview of the first batch of cards, 43 on the table of which 42 are sent, I think there was one (the first one I made) which simply wasn’t good enough, it was merely an inspiration card. 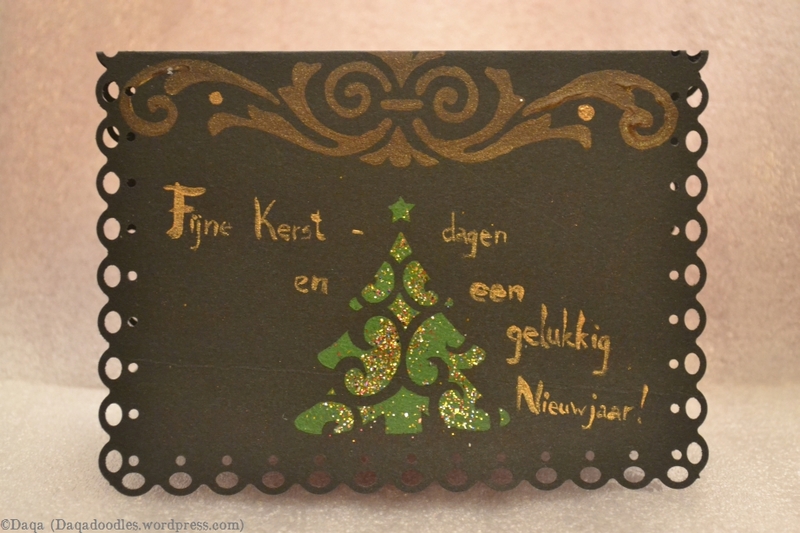 Hier mijn zelfgemaakte kerstkaarten. Sommigen vind ik erg mooi geworden, en sommigen heb ik uiteindelijk toch maar niet verstuurd. Ik wilde ze niet op mijn blog plaatsen voordat de ontvangers ze hadden gekregen, vandaar dit bericht pas in het nieuwe jaar. 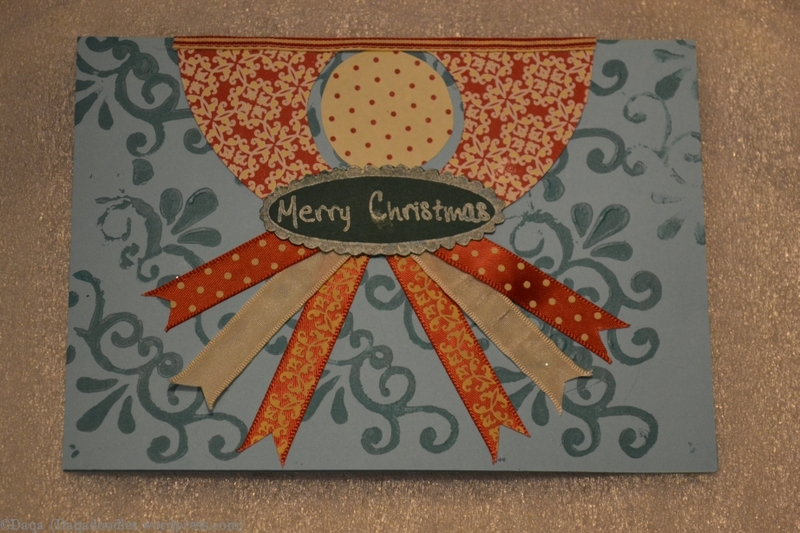 Here my selfmade christmas cards. Some have turned out good, but others I didn’t like and didn’t send off. I didn’t want to show them on my blog before the receivers got them, that is why I post this message now in the new year. 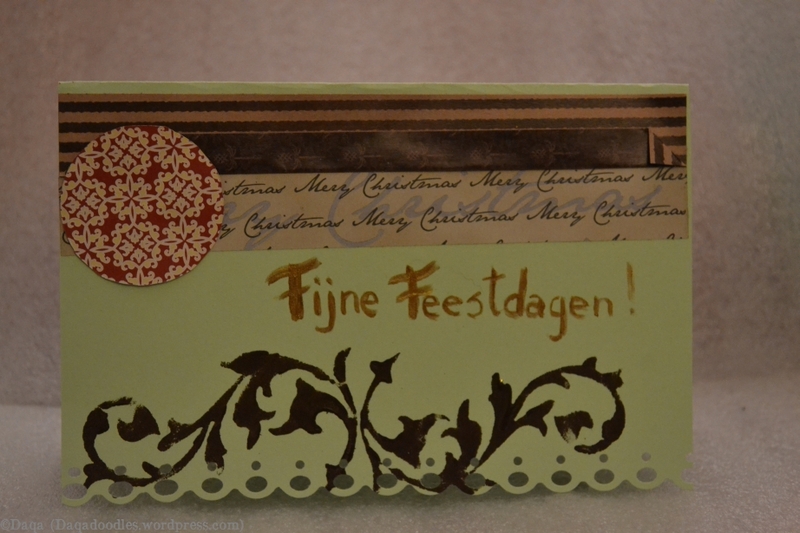 Eerst een overzichtsfoto, daarna per stuk alle kaartjes./ First an overview picture, then one by one all cards. Nadat de kaarten verstuurd waren zag ik dat de foto’s wat donker waren, ze zijn zonder flits genomen omdat de kleuren anders niet kloppen. Volgende keer voeg ik meer licht toe! / After I sent the cards I noticed the pictures are a bit dark, I made them without a flash because the colours wouldn’t be correct if I did. Next time I’ll add more light though! Om te beginnen 3 van mijn favoriete kaarten. / Starting off with 3 of my favourite cards. Deze kaart moet 90 graden gedraaid worden. Ik geloof dat ik nog wat achtergrondtext benadrukt heb of nog een aparte kerstwens heb toegevoegd. De achtergrond met kerstwensen in verschillende talen was wat aan de lichte kant. This card should be turned 90%. Also I think I highlighted or added a more clear christmas wish. 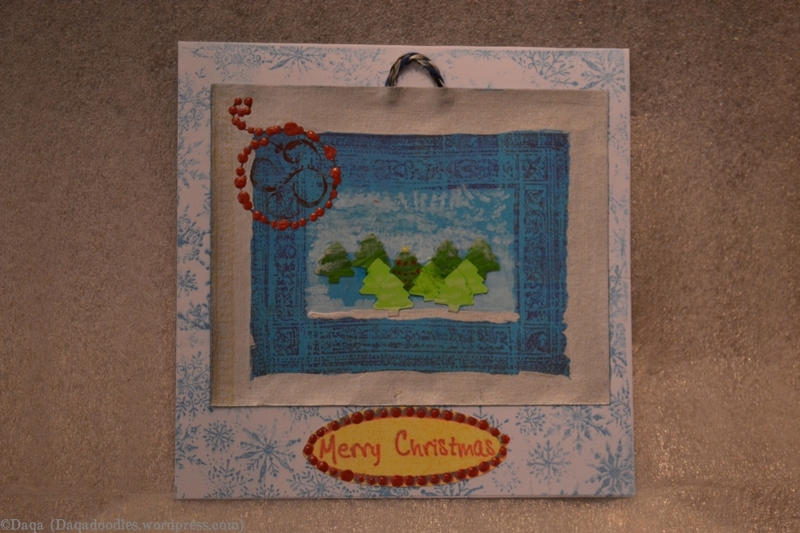 The background (with christmaswishes in several languages) was a bit too light. Verschillende kleuren uitproberen. Zoals je ziet, niet altijd geslaagd. Experimenting with different colours. 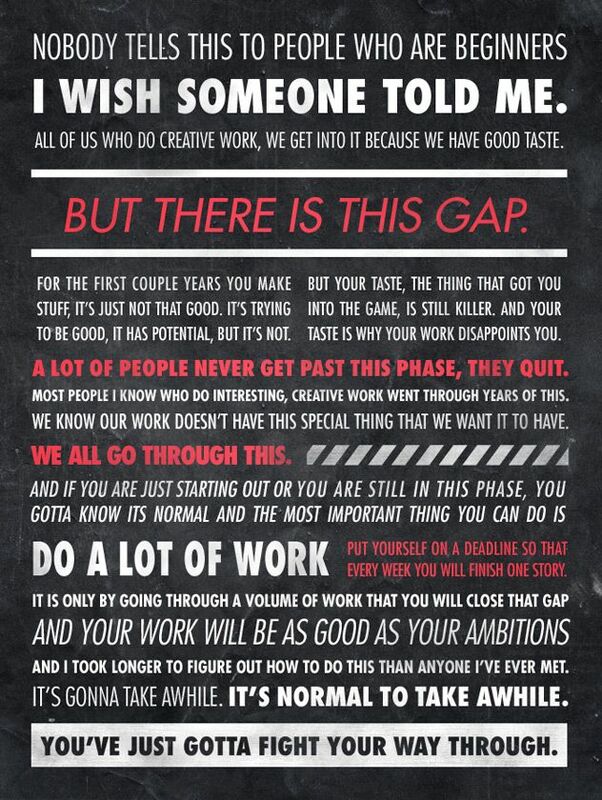 As you can see not always succesfull. Deze twee zijn beter gelukt, alhoewel de foto’s de kleuren niet mooi weergeven. De kaart hier direct boven is namelijk wit en niet licht-roze. 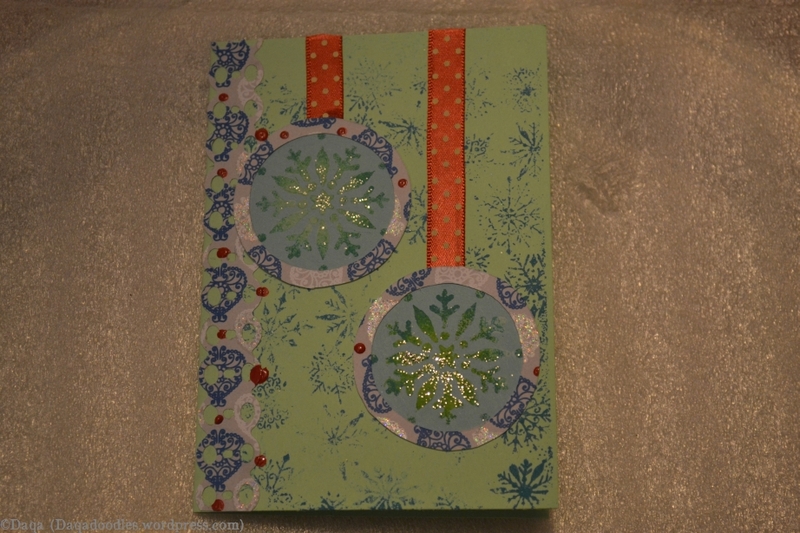 Het wit is met mod podge ingesmeerd, daarna zijn de “sneeuwvlokjes” erop gestrooid. / These two are more succesfull, though the pictures don’t present good colours. 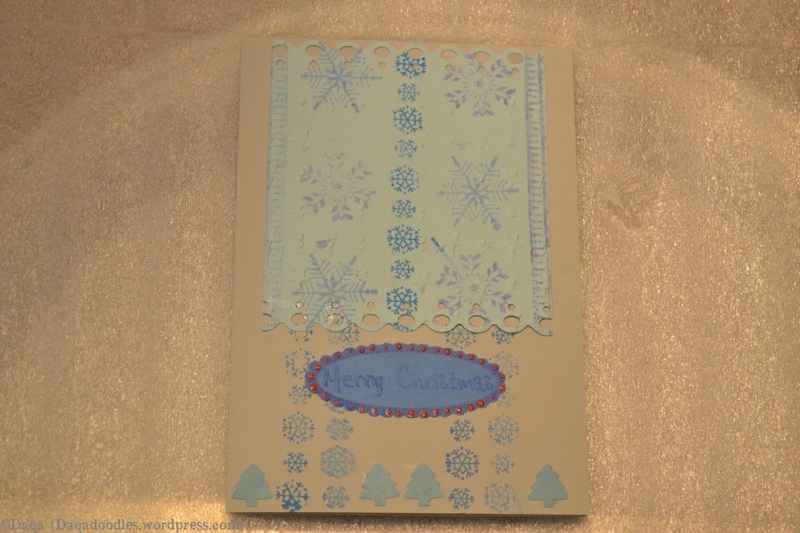 The card directly above from here is actually white, the white part is covered in mod podge and then I sprinkled the “snowflakes” over it. Deze laatste is weer wat anders dan de rest, en eigenlijk wel grappig geworden. 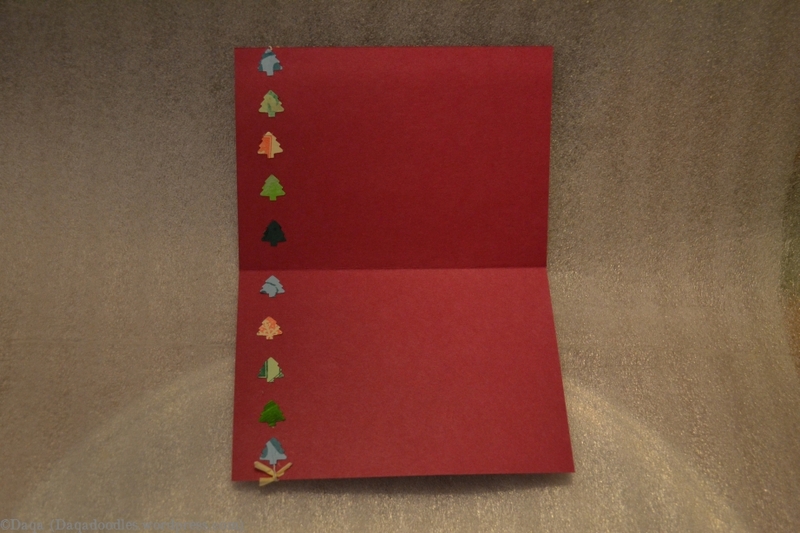 Een landschapschilderijtje met kerstbomen, met een bijna omgekeerde creëer volgorde: eerst de lijststempel, toen het zilver, dan de balstempel, kerstbomen en toen pas de sneeuw. Daarna de “basis” kaart gemaakt. 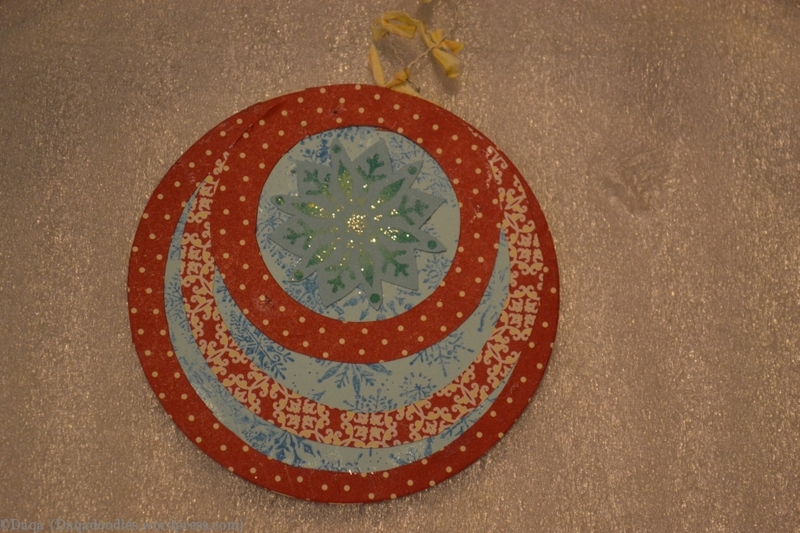 De ontbrekende kerstboom (links van het midden, dat blauwe vlakje) is later teruggeplakt. / This last card is a bit different then the rest, and ended up quite funny (in a good way). 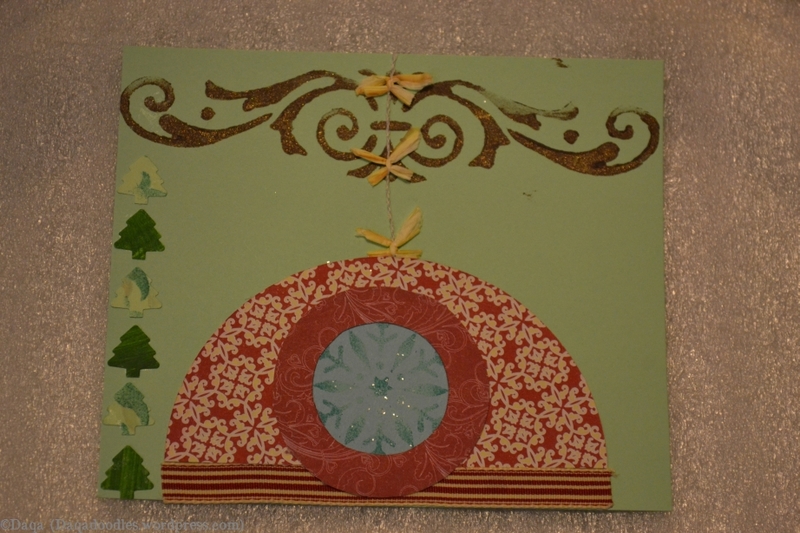 A landscape painting with christmastree, and an almost reversed creation sequence: First I stamped the fram, then painted the silver, added the ornamentstamp, chirstmastrees and then painted the snow. 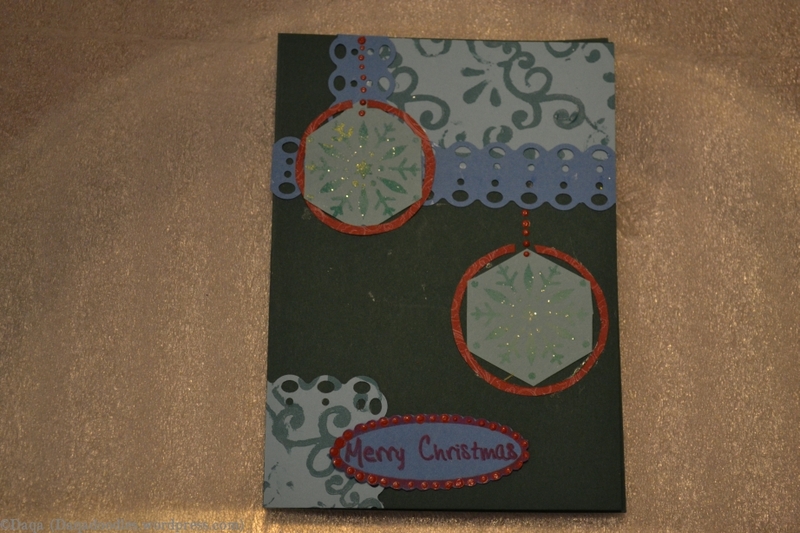 After that I made the card onto which I glued the painting. 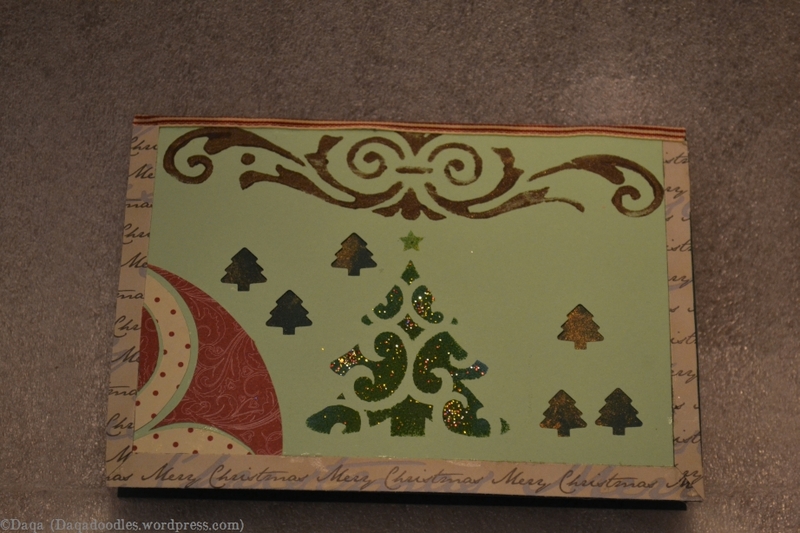 The missing christmastree (left from the middle, blue spot) was glued back before sending it off. Welke is jouw favoriet? / Which one is your favourite?